Ladies and gents, meet the new Sony Xperia M smartphone, running Android 4.1 Jelly Bean! What the "M" in its title stands for is not clear, although "mid-range" would be a fitting guess as that's the category this smartphone belongs to. It packs a 4-inch TFT display with a resolution of 480 by 854 pixels, a 1GHz, dual-core Snapdragon processor, and a 5MP Exmor RS camera that can capture 720p video at 30 frames per second. It is worth noting that the Sony Xperia M follows the company's OmniBalance design principles, so it is quite a looker. The smartphone is also compact, with a weight of 124 grams and thickness of 9.3 millimeters. Below its screen we see the typical for Sony smartphones RGB light strip, displaying colorful alerts for missed calls or pending notifications. Further specs include a front-facing camera, 4GB of storage expandable with a microSD card, 1GB of RAM, and a battery that can deliver 10 hours of continuous talk time. The longevity of the Sony Xperia M can be expanded with the built-in Stamina mode, which turns off some or all of the phone's radios whenever they are not in use. The Sony Xperia M will be available in black, white, and purple, but a yellow, dual-SIM variant of the device is in the works as well. Expect seeing the smartphone launch globally during the third quarter of 2013. Pricing has yet to be announced, but it will likely vary between regions. 4th June 2013, London, United Kingdom – Sony Mobile Communications (“Sony Mobile”) today introduces Xperia M featuring Sony’s innovative one-touch functions for effortless connectivity, and signature premium design. Xperia M is designed to bring Sony experiences to a new market and price point; NFC connectivity for one-touch functions, stunning design and a range of technologies including: a high quality screen for sharp viewing; smart camera functionality for impressive pictures and videos; Battery STAMINA Mode for outstanding battery life; and Sony’s signature media apps for enjoying photos, music, movies and games on the go, integrating Sony Entertainment Network services directly in the apps. Xperia M features Sony’s one-touch functions allowing you to easily and instantly enjoy photos and music across an array of devices, such as Sony’s SBH20 wireless stereo headset and latest range of NFC-enabled BRAVIA TVs, with just a single touch. Xperia M boasts Sony’s now familiar OmniBalance design, first introduced in flagship Xperia Z. The aesthetic language takes the form of a precision-crafted skeleton frame, and gives the phone a seamless look that is both tactile and sleek. Designed to complement the slim style, Xperia M also features colour-changing illuminations that can be personalised to visually alert you to incoming calls, text messages and alarms. Xperia M and Xperia Mdual will be available in Black, White and Purple - a Yellow colour variation will also be available for the single SIM model. Xperia M benefits from Sony’s media applications, offering consistent entertainment experiences across mobile, tablet, desktop and console platforms. The “WALKMAN”, Album and Movies apps, provide online and offline content through a single access point with new ways to enjoy and share that content. The “WALKMAN” application provides access to all your downloaded music, plus Music Unlimited* with over 18 million songs to explore, and Facebook social integration. The “Movies” application gives consumers access to over 100,000 movies and TV series from Video Unlimited*. The “Album” application enables easy access to Facebook friends’ photos, as well as the ability to organise images both by location and, through the new “Faces” function, by the people that feature in them. Sony’s entertainment technology turns content into experiences, and with Xperia M you can enjoy these experiences for longer thanks to Battery STAMINA Mode. The latest version of Sony’s battery management technology improves the standby time of your smartphone by four times or more**, by automatically shutting down battery-draining apps whenever the screen is off and starting them up again when the screen is back on. The Dual SIM variant Xperia M dual lets users select between two SIMs before making a call or sending a message with just a single click. Each SIM card can also be customised separately – for example, a formal ring for business or another tune for pleasure - perfect when users want to separate work from play, and handle calls more efficiently. Xperia M and Xperia M dual from Sony Mobile will both be available worldwide from Q3 2013.
what i am expecting is poor and noisy snaps .. This one should be the successor of Xperia J, Heck, Xperia J isnt even 1 year old yet but it lags even in normal homescreen navigation, i hope this one is a lot better. Good to see more colors being offered. I guess this will be quite good. After all, the Xperia J is powered by Snapdragon S1. Didn't even know that that exists..... And this is by Snapdragon s4. Quite a huge different. Guess more than half the world Still waiting for JB on XP. Sony updates are HORRIBLE. Oh now every phone that uses the yellow color looks like a Lumia? M = Masochist That's the first word i could think of. M = Mini That's the first word I could think of. Look at that bezel....but grants Sony all new phones add to the competition! Not really. 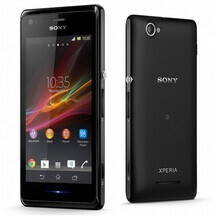 Sony already released Xperia E which is priced same as Lumia 520. But the Lumia 520 has much better specs (WVGA vs HVGA on Xperia), (8GB vs 4 GB), (5 MP vs 3.2MP on Xperia), (S4 dual core vs old single core) etc.. I think this is lumia 620 competitor. But Lumia 520 is huge success while Xperia E is a flop at least in India. The reason is specs are very bad for what you are paying. HVGA screen and android lags like hell on those old processors. But the processor on this new Xperia M should be good. true that! xperia j, xperia e and the recently released xperia L is a complete fail where i live. and this xperia m will follow soon. good exterior, sh!t interior. even the s4 mini has better resolution and ram and bang for the buck than this. and most importantly sony is overpriced compared to other low end phones. well sammy release 2 giant phone, while sony releasing cute phone, but i dont know if thats going to sell. ZR is a competitive one, where the hell is the 2nd flagship?? Decent specs, cute design, the yellow one looks funky. Good job Sony!